DrawIng on over 30 years refIning and applying ACT, initially with new CEOs and their teams at Harvard Business School and then by supporting leaders of corporate transformationa across a variety of industries. Robert H. Miles and Michael Kanazawa layout a simple and compressed roadmap for stepping an organization and all of its employees through a sequence of phases that ensure transformation success. ACT strips away complexity and indecision, helping you move far more rapidly and predictably from confronting reality and strategy development through execution to breakthrough results, at any level, in any function, in any organization. 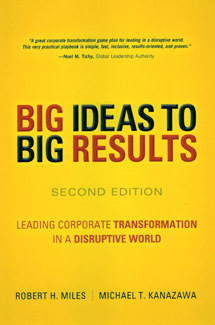 "A great corporate transformation game plan for leading in a disruptive world. This very practical playbook is simple, fast, inclusive, results-oriented, andproven."